According to King of Comedy son Eric Quizon, His Dad "Dolphy" is in critical condition right now. Dolphy was rushed to Makati Medical Center last week because of his chronic obstructive pulmonary disease (COPD). Eric said in a text message to ABS-CBN News, "Dad is critical at the moment. I hope you understand if I can't talk right now. Will update you later. We need your prayers." King of Comedy is in need of our prayer, it is better to say a true prayer than to say a non-sense rumor about the life of King of Comedy. Last Monday, Eric told that his father was finally off his ventilator machine and was only dependent on an oxygen tank. 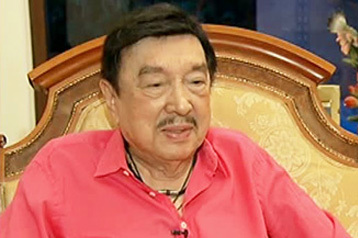 He is turning 85, I pray that Dolphy's condition will become okay so he may celebrate his birthday on July 25. Comments or suggestions about "King of Comedy Dolphy in Critical Condition" is important to us, you may share it by using the comment box below.